We awoke this morning and headed down to floor minus 2 for breakfast. I guess floor minus 1 is like a basement and floor minus two is like a cellar. It is actually quite neat. I'll take a photo. We ate and then headed out to the St Michel fountain to meet for our walking tour. Oh, and it wasn't raining, it was now drizzle . At 11:15 we set off on the tour with the first stop the Notre Dame Cathedral. It was started in 1163 and took 107 years to build. It was the first time the flying buttress architecture was ever used which allowed for the wide spans and the use of stone for the high arched ceilings. We also heard the story of Christian martyr Saint Denis who was the first bishop of Paris in the third century when the city was still run by the Romans. He had angered the powers that be by practicing his religion and was sentenced to death. He was beheaded but it is said that he picked up his head, continued reading scripture and walked 10km before dying. He was beheaded on the highest hill in Paris which is now called Montmartre (Mount Martyr). His headless figure shows up in the carvings on the Notre Dame and many other places in Paris. We saw the first French Royal Palace which eventually the Germans occupied in World War II and is now a court and jail. There are bullet holes on the outside, one of the few places in Paris where buildings were damaged in the war. It started pouring rain as we saw Paris' first stone bridge commissioned by King Henry IV after invaders kept burning the wooden bridges. He had a party to celebrate the opening and there were many drunken guests which the King had an artist sketch. The sketches were then carved in stone and are now placed on the bridge, or so the story goes. Then there are the locks on the bridges. Lovers buy a lock, fasten it to the bridge, pledge their love for each other and throw away the key into the Seine River. Next we were off to The Louvre, which was the second Royal Palace to be built (another is the Palace in Versailles). It is now a huge museum (one of the world's largest) housing Royal owned art and art thieved by Napoleon Bonaparte. The first piece of art in the museum was The Mona Lisa. The rain was ending now so we continued through the Arc De Triomphe du Carrousel celebrating Napoleon's victories which has a reproduction sculpture of 4 horses on top which Napoleon took from Saint Mark's Cathedral in Venice (the originals have now been returned). Then we were in the royal gardens, The Tuileries, which extend more than a kilometer and end at the Place De La Concorde which is where the guillotine was located and where King Louis XVI and Queen Marie Antoinette were beheaded. The guillotine was replaced in 1836 by a 3300 year old obelisk that the Egyptian government gave the French and was originally located at the entrance to the Luxor Temple. Seen from a distance, we heard how the Eiffel tower was built for the 1889 World Fair to showcase using steel for construction instead of stone and it was to be dismantled after 20 years but it is still here today. The steel tower can expand and contract 6 inches due to the temperature changes. We saw The Grand Palais which was significant in World War II. Hitler had ordered Paris to be burnt to the ground before retreating from Paris after the D Day landings rather than let it fall undamaged into the hands of the Allied Forces. The General in charge of carrying out this destruction had come to admire the city during the occupation and disobeyed the orders to burn the city, so they shelled a few buildings setting The Grand Palais ablaze. When Hitler asked "is Paris burning"? The General was able to reply yes and Hitler then ordered the retreat sparing Paris. Next we crossed the most ornate bridge in Paris the Pont Alexander III built by the Russians as part of the Franco-Russian alliance, (the French built one in St Petersburg for the Russians). We ended our walking tour at Les Invalides, a military hospital. Apparently, it was here that the Revolutionists came and got their weapons before marching to the Bastille in 1789. It is also where Napoleons tomb is located. Napoleon supposedly had specified that people had to bow to him even after death so his tomb is located one floor down thereby making you lean or bow over a railing to see it. 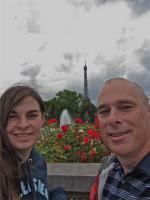 After the tour, Brenna and I wandered up to and under The Eiffel Tower, then down the Seine River to see the mini Statue of Liberty. Afterwards we retraced our route all the way back to The Louvre. This time we went in and saw Leonardo da Vinci's Mona Lisa and many other paintings, sculptures, carvings and artifacts collected over the years. They say if you spent 30 seconds admiring each piece of art in The Louvre, it would take one month to see. We only had a couple and a half hours!!! We then headed back to the Notre Dame for a closer look and some photos. We got a crepe and a panini for supper then stopped at a shop to pick up a baguette, ham, and cheese for the hotel room. Yes it is still raining. We should demand a refund for our vacation and come back in the rainy season!!! Another really long day walking close to 30 km again.